Cardiac surgery with cardiopulmonary bypass (CPB) is often complicated by tissue edema as a consequence of a systemic inflammatory response and vascular endothelial hyperpermeability [1–3]. We previously showed that this impairment of endothelial barrier function and subsequent fluid shift hampers microcirculatory perfusion [4–6] and contributes to the development of postoperative organ dysfunction, in particular acute kidney and lung injury . The angiopoietin/Tie2 system has been proposed as a key signaling pathway in CPB-related endothelial hyperpermeability [8–11]. Tie2 is a vascular restricted tyrosine kinase receptor with specificity for angiopoietin-1 and angiopoietin-2 binding . In quiescence, angiopoietin-1 binds to Tie2, resulting in receptor phosphorylation and inhibition of inflammation. During stress as observed in CPB, stored angiopoietin-2 is released from Weibel-Palade bodies and competes with angiopoietin-1 for Tie2 binding which antagonistically reduces endothelial barrier function and increases inflammation . The potential of angiopoietin-2 as a biomarker for endothelial dysfunction and unfavorable outcome has been extensively investigated in septic populations [13–15], but has been restricted to in vitro models [3, 8] or the evaluation of plasma markers in cardiac surgery patients [9, 10, 16]. Increased plasma angiopoietin-2 levels following CPB are associated with prolonged mechanical ventilation  and acute kidney injury . We and others showed that the onset of CPB is associated with an acute impairment of in vitro endothelial barrier function [3, 8]. In addition, we previously showed that targeting Tie2 with an angiopoietin-1 mimetic could reduce pulmonary vascular leakage and preserve in vivo microcirculatory perfusion during and after CPB in an experimental model , implying the importance of angiopoietin-1-dependent Tie2 signaling and endothelial integrity to maintain microcirculatory perfusion and organ function after CPB. Although recent studies emphasized the biological and clinical relevance of increased angiopoietin-2 levels in the first hours following CPB [8–10], the connection between postoperative angiopoietin-2 levels, endothelial barrier function, and microcirculatory perfusion following CPB remains to be elucidated. We therefore aimed to investigate the postoperative effects of cardiac surgery with CPB on in vitro renal and pulmonary endothelial barrier function and their relation with circulating angiopoietin/Tie2 and microcirculatory perfusion. Endothelial hyperpermeability is increasingly recognized as a key pathophysiological contributor to postoperative organ dysfunction following cardiac surgery with CPB [7–10]. However, this parameter is clinically limited to the evaluation of fluid overload reflected in pulmonary and renal performance. Despite the growing number of clinical studies evaluating the course of circulating endothelial injury markers, evidence for a causal relation between endothelial barrier dysfunction and impaired oxygenation is scarce and mainly restricted to experimental models [4, 5]. In line with previous studies, we found that the effects of patient plasma withdrawn following CPB associated with reduced in vitro endothelial barrier function. In addition, our results extend previous findings by revealing that this induced loss of endothelial barrier function can be observed in both renal and pulmonary endothelial cells and persists in the first three postoperative days. Vascular endothelial permeability following CPB-associated systemic inflammation is regulated by several mechanisms of which the angiopoietin/Tie2 system is postulated as central regulator [7–9]. Tie2 is an endothelium-specific transmembrane tyrosine kinase receptor, with angiopoietin-1 and angiopoietin-2 as most dominant ligands . The paracrine agonist angiopoietin-1 protects endothelial integrity by strengthening intercellular junctions. In contrast, the competitive antagonist angiopoietin-2 is released from Weibel-Palade bodies during inflammation and increases endothelial permeability. 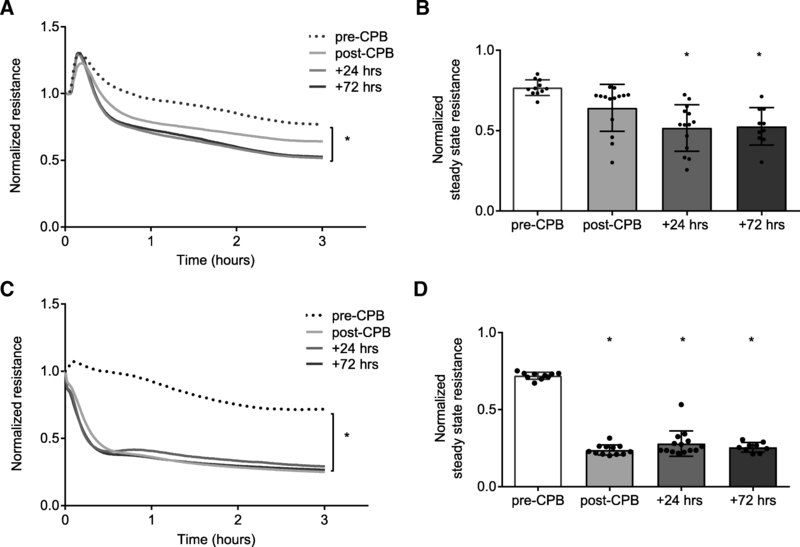 The observed endothelial barrier disruptive effect of plasma obtained after CPB was more severe in pulmonary endothelium compared to renal endothelium. This could be due to differences in endothelial Tie2-receptor expression levels, since Tie2 is most abundantly expressed in pulmonary microvasculature . Inhibition of Tie2 via angiopoietin-2 following CPB triggers endothelial hyperpermeability by reducing junctional VE-cadherin , the essential component of cell-cell junctions. We indeed found that functional loss of endothelial barrier was paralleled with profound changes in cell structures, such as reduced VE-cadherin at cell-cell junctions, increased stress fiber formation, and intercellular gap formation. As both renal and pulmonary function highly depend on intact microvascular barrier, it may not be surprising that complications after CPB mainly present themselves in these organs [12, 13, 16, 23]. Besides angiopoietin-2, additional barrier disruptive mediators are involved in CPB-associated endothelial hyperpermeability. Like angiopoietin-2, von Willebrand Factor is stored in Weibel-Palade Bodies and immediately released upon onset of CPB. 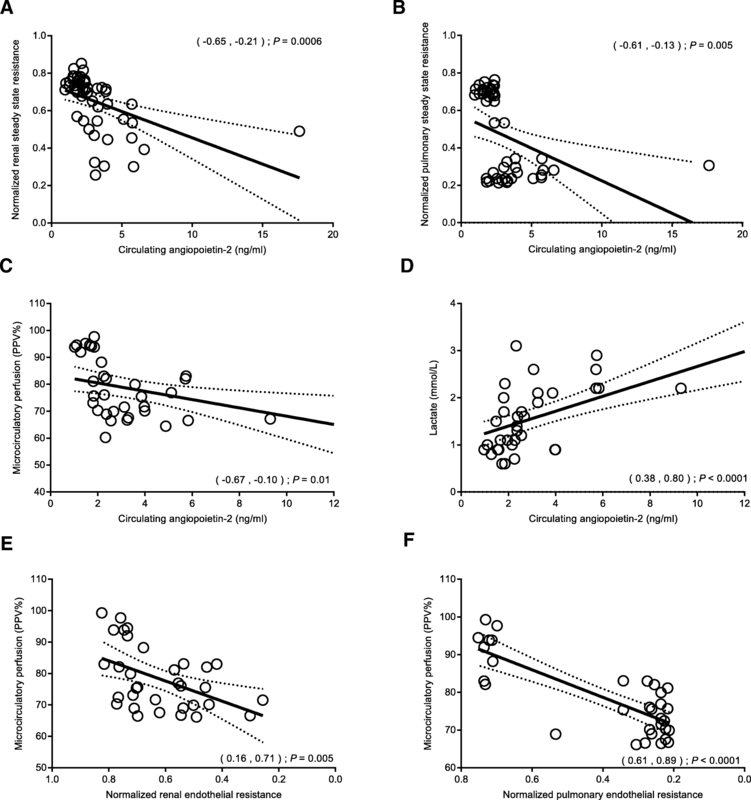 Release of von Willebrand Factor and generation of thrombin activates coagulation, increases endothelial permeability, and stimulates release of angiopoietin-2. Besides Tie2 inhibition, activation of vascular endothelial growth factor receptor-2 (VEGFR2) is known to increase permeability by internalizing junctional VE-cadherins . Moreover, VEGF is thought to increase permeability by promoting proteolytic cleavage and shedding of the Tie2 receptor . We indeed found increased soluble Tie2 levels at the third postoperative day, suggestive of Tie2 receptor cleavage and shedding after CPB. Altogether, multiple regulatory systems are involved in CPB-associated endothelial hyperpermeability, but all potentiate angiopoietin-2 release. Inhibition of circulating angiopoietin-2 or stimulation of Tie2 activity may therefore provide interesting future therapeutic targets to attenuate postoperative evolution of CPB-associated endothelial hyperpermeability [29–31].